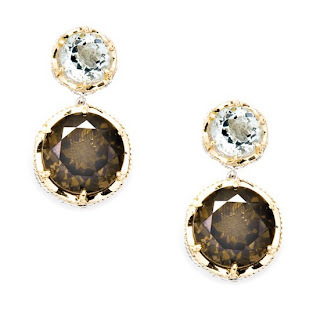 Luxist is giving away a pair of Tacori smoky quartz and prasiolite earrings (valued at $880) on behalf of Since1910.com. The earrings are from Since1910.com's Tacori collection. For your chance to win, just visit the post at Luxist.com and leave a confirmed comment before 5PM (EDT) on October 4, 2010. The winner will be selected at random. New Watches from Bedat & Co.
Bedat & Co. is back with a vengeance this holiday season with the beautiful model 883 Extravaganza edition watch. 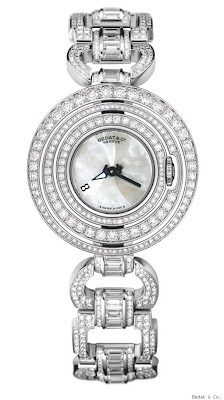 With a mother-of-pearl face and 11 carats of diamonds, this elegant timepiece will brighten up any lady's arm. I just discovered How-To-Make-Jewelry.com. There's some good stuff there. Do you make your own jewelry? Have you wondered how much you should be charging? It really doesn't have to be complicated. In fact, if done right, pricing your jewelry can be quite simple and quick. Let me give you an example. Have you ever spent $20 on supplies and then doubled the sales price? That sounds logical right? The problem is, you'll never be profitable that way. Sure you're covering the cost of your supplies, but are you making a fair return for your time? Are you covering your rent? Insurance? Business license fees? Taxes? Do you show your jewelry at shows? There's a cost for that as well. If you're working hard to make a quality product, you deserve to be compensated (and your customers will agree). Here's a better way, first calculate the cost of your supplies. Then calculate how long it took you and multiple that by how much you should be making per hour. Now multiply the result by about 10 or 15% (to cover other overhead). Does that seem expensive? Worried you'll lose customers? That's a valid concern, but remember that people's priorities can change quickly when they find something they really like (or that goes with multiple outfits). Try this, create 3 (or more) necklaces of varying levels of quality. Now use a different pricing strategy for each. For the simplest one, use your regular pricing strategy. For the nicest one, try the strategy outlined above. Price the other one somewhere in the middle. I think you'll quickly see that people aren't that bothered to spend quite a bit more when they find something they really like. What do you think? Have a better strategy? Think this is unfair? Add your comments below.